There had been a growing realization of the need of a women institution to quench particularly the educational thirst of the women-folk of Pundri and the surrounding rural area, as their parents would not, due to social taboos, send their daughters in most of the cases to co-educational institutions for pursuit of higher studies. This dream was ultimately realized way back in 1984 when indefatigable efforts by late Ch. Ishwar Singh Ji, a pioneer in the field of rural education, coupled with the all-out cooperation of the local residents fructified into a promising institution KANYA MAHAVIDYALAYA, Fatehpur-Pundri, Later named as Ch. Ishwar Singh Kanya Mahavidyalaya, Fatehpur-Pundri. Ch. 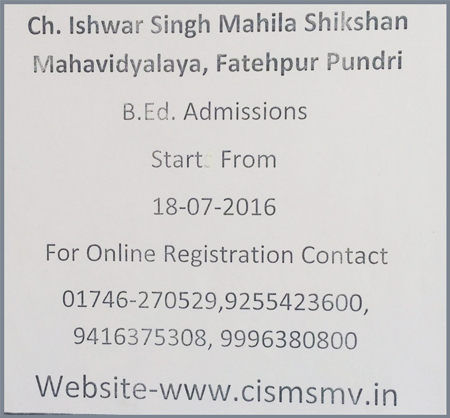 Ishwar Singh Mahila Shikshan Mahavidyalaya, Fatehpur-Pundri was propounded in 1993 as Kanya Shikshan Mahavidyalaya. I take this opportunity to introduce us to you and bring to your notice that CHAUDHARY ISHWAR SINGH MAHILA SHIKSHAN MAHAVIDYALAYA , Fatehpur-Pundri Distt- Kaithal is starting a Tearcher's Training College.